In 1912 the average life expectancy (at birth) for whites in the United States was 48 years, and for non-whites it was 34. The US was a wealthy nation, but life for its common citizens was not easy, and as in other industrialized nations people who hired their labor to employers wanted as much wealth in wages as they could get, and better working conditions. When Polish women weavers at Everett Cotton Mills realized that their employer had reduced their pay by 32¢ they stopped their looms and left the mill, shouting "short pay, short pay!" Workers at other mills joined the next day; within a week more than 20,000 workers were on strike. The strike spread rapidly through the town, growing to more than twenty thousand workers and involving nearly every mill in the city – what became known as the Lawrence Textile Strike. Immigrants from fifty-one nations were involved, surprising many within the American Federation of Labor. They had doubted that immigrants – often used against organized labor – could be organized. The strike lasted more than two months, during winter. A bystander was killed. Police were called out. The Industrial Workers of the World (IWW) sent Bill Haywood and Elizabeth Gurley Flynn who took over leadership of the strike. They sent hungry children of the striking families to New York, New Jersey and Vermont, and the publicity that accompanied this spread sympathy for the strikers, especially after police tried to stop a further exodus of children by blocking their departure at the local train station. President Taft asked his attorney general to investigate. A Republican dominated Congress began a hearing on the strike. Conditions in the Lawrence mills were exposed, and in Congress there were calls for investigation of the "wool trust." Mill owners decided it was in their interest to improve relations with their employees and to settle the strike. They gave their workers in Lawrence and throughout New England raises of up to 20 percent. 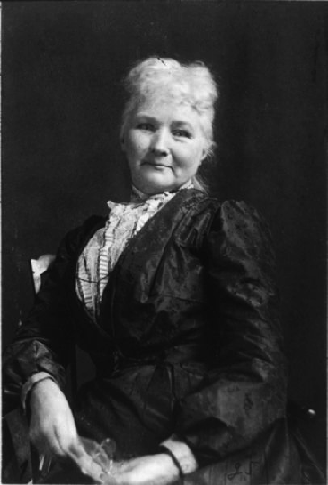 Mother Jones, labor organizer, 1902 photo, the year she was called the "most dangerous woman in America." She would be denounced on the floor of the US Senate as "grandmother of all agitators." She was another strong woman immigrant from Ireland, like Billy the Kid's mother who was born there a few years earlier. The confrontation directly caused perhaps fifty violent deaths, as well as many more deaths indirectly caused by starvation and malnutrition among the striking miners. In the number of casualties it counts among the worst conflicts in American labor union history. The United Mine Workers of America (UMWA) promised to finance the strike and to aid the strikers. Partly because of the influence of the UMWA, the strike was conducted without violence during its first month. But violence came in May, after mine owners aiming to break the strike hired the Baldwin–Felts Detective Agency, with its army of enforcers. A labor organizer for the UMWA, Mary Harris "Mother" Jones arrived. In 1902 she had been called "the most dangerous woman in America" because of her success in organizing mine workers and their families. She was now seventy-six. Mine owners were evicting miners from their company-owned rented houses and bringing in replacement workers. Mother Jones rallied the workers and made her way through armed guards to persuade other miners to join the strike. On September 1 a force of over 5,000 miners from the north side of the Kanawha River joined the strikers. Governor Glasscock established martial law in the region. Strikers were forbidden to congregate. Those arrested were tried in a military court. Mother Jones was put under house arrest. A new Republican governor, Henry Hatfield, took office on March 4, 1913, the day of President Wilson's inauguration and speech about correcting evil. Governor Hatfield released around thirty individuals held under martial law, including Mother Jones, whom he ordered moved to Charleston for medical treatment. The governor left strikers he thought to be exceptionally radical in jail. In April he imposed conditions for a strike settlement: strikers had the choice of accepting Hatfield's terms, considered by some as favorable, or deportation from the state. The settlement included a 9-hour work day, the right of employees to shop in stores not owned by the mining company, and elimination of discrimination against union members. On May 1, the Paint Creek miners accepted and signed the "Hatfield Contract." A newspaper centered in Charleston, West Virginia, the Socialist and Labor Star, described the settlement as a "sellout." On May 8, Governor Hatfield sent his National Guard against the paper, damaged it and closed it down. Cabin Creek miners continued to resist with some violence until the end of July. Governor Hatfield's attack on the Socialist and Labor Star became a case in the state's courts, which ruled in favor of the governor. Copper mining had become big business with the use of copper in electrification. In Michigan, those laboring in the mines were working 10 to 12 hours and earning from $2.00 to $3.00 per day, and the death rate per year was one in every 200 miners. Several violent strikes in the West, led by the Western Federation of Miners, had won higher wages, and miners in Michigan were interested in similar improvements, including an eight-hour day and the freedom from the paternalist and authoritarian atmosphere that had been forced on them. The Calument & Hecla Mining Company owned the houses and everything else in town and was trying to run the lives of their miners, including where they shopped. The company's manager, James MacNaughton, was not for bargaining with his employees, especially about pay. He didn't accept the argument that labor was contributing to the wealth and should be able to bargain with the owners as to how that wealth should be divided. As MacNaughton saw it all the wealth belonged to the company and the workers had to accept what it was offering in wages or leave. With MacNaughton refusing to negotiate, a strike was called on July 23, 1913. In addition to a shorter work week, higher wages and union recognition, the miners were unhappy about the hardship that arose from use of a "one-man drill." 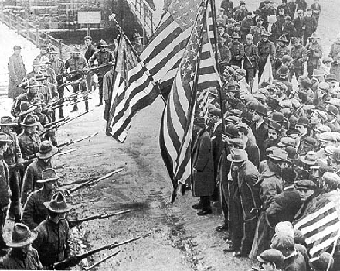 The strike in Michigan in 1913 was called without approval from the Western Federation of Miners. The unions were extremely low on funds following recent strikes and failures in the West. The union supported the strike but faced great difficulties providing pay and supplies to the strikers. Strikers surrounded the mine shafts to prevent others from reporting to work, and almost all mines shut down. The company brought in recent immigrants from New York and Chicago. Strikers resorted to violence. Michigan's Governor Ferris, a Democrat, responded to the violence by dispatching the National Guard. The mines were reopened under National Guard protection, and many went back to work. By August 1913, most mines had enough workers to operate on a limited basis. On Christmas Eve 1913, the Western Federation of Miners organized a party for strikers and their families at the Italian Benevolent Society hall in Calumet. The hall was packed with between 400 and 500 people when someone shouted "fire." He was to be described by several witnesses as wearing a button of the Citizens' Alliance, an anti-union organization. There was no fire, but 73 people, 62 of them children, were crushed to death trying to escape. This became known as the Italian Hall Disaster. Shortly after the disaster, thugs broke into his hotel room of the labor leader Charles Moyer, beat him and forced him, out of town, still bleeding, on a train headed for Chicago. The union attempted to rescue the strike, calling for and getting a Congressional investigation on conditions in Michigan. The strikers held out until April 1914. The Western Federation of Miners was now without funds. Nothing came of the Congressional Committee investigating conditions in Michigan, despite many questions and a lengthy report. Encouraged by the kidnapping and forced deportation of Moyers, anti-union groups were calling for the removal of union organizers and "agitators" from the area, and the union's organizers were being chased out of Michigan as they had been in the West. The strike ended with some concessions in wages, hours and working conditions. The old paternalism of the mining companies was abolished. Workers' lives were no longer watched by the mining companies, which stopped many of the services they had previously provided. In the year 2013 the Public Broadcast Service (PBS) produced a one-hour program titled Red Metal: the Copper Country Strike of 1913. In September 1913, coal miners in Colorado went out on strike against the largest coal operator in the West, a company bought by John D Rockefeller Jr in 1902: Colorado Fuel and iron. The strikers were organized by the United Mine Workers of America (UMWA). The death rate in Colorado's mines for the year 1912 had been around one in every 143 workers. There was constant risk of expulsion, suffocation and collapsing mine walls. The macho enjoyment of the danger by some miners decades earlier had diminished. The miners were living in company towns and houses, and, as in West Virginia, the companies provided health care but also tried to control the lives of the miners. They were ready to crush any expression of dislike of the company-worker arrangement. Company guards with machine guns and rifles would not admit any suspicious stranger into the camp and would not permit any miner to leave. Dissent came in the form of a strike led by so-called outside agitators. The striking miners demanded the equivalent of a 10 percent wage increase, an eight-hour work day and recognition of their union as a bargaining agent. Agents shone searchlights on the tent villages at night and fired bullets into the tents at random, occasionally killing and maiming people... Frequent sniper attacks on the tent colonies drove the miners to dig pits beneath the tents where they and their families could be better protected. This was while Henry Ford, at the beginning of the new year, 1914, was making his fellow industrialists angry by raising the pay of his workers to $5.00 per hour, looking toward his workers earning enough to afford what they were manufacturing. In Colorado, rifles and machine guns were used in a day-long attack against a tent colony of striking workers, and this resulted in the violent deaths of between 19 and 25 people, reports of the death toll varying. It included two women and eleven children asphyxiated and burned to death under a single tent. It was to be called the Ludlow Massacre. A public outcry gained the attention of Congressional members of the House Mines and Mining Committee, as well as President Woodrow Wilson. He sent federal troops that disarmed both sides, and he proposed that the union agree to a truce with the owners and to form a grievance committee at each mine. In October, 1914, Congress passed the Clayton Antitrust Act, which moved the country further along in what historians call the Progressive Era (1890 to the 1920s). The act included a section declaring that unions could not be considered unlawful combinations per se and that strikes, boycotting and picketing were not violations of federal law. The strike in Colorado needed more. In December the UMWA ran out of the money needed to keep the strike going. It ended without the company having to recognize the strikers' union. Many strikers had lost their job to those they called scabs. The strike encouraged Rockefeller to improve relations with employees. He ended discrimination against workers who belonged to unions, and he included workers on committees dealing with working conditions, safety, health, and recreation, and there was to be a labor union run by the company. Miners in Colorado voted to accept Rockefeller's plan, while others in the labor movement disliked it.